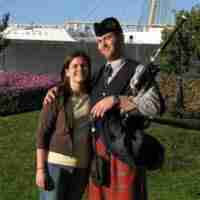 Todays guest, joining us on the Join Up Dots free podcast interview is Mr Andrew Douglas the founder and CEO of the Piper’s Dojo, the number one place to go for all your bagpipe needs. He learned the pipes at age 8 from his father, Bruce, who sent his interested son on to the great Donald Lindsay for lessons by the time he was 9. Through Donald, our guest had the opportunity to meet and study with amazing world famous piping greats. Though only in his early 30’s, he is already known as perhaps one of the top bagpipers in North America. But its not just playing these iconic instruments where he has come into his own as his compositions were featured on more than one World-Championship-Winning performance. He is the author of the “Bagpipe as an Extension of your Self tutor”, which has inspired countless pipers to learn and re-learn the pipes. He has a passion for developing true expression in players, based on their own thoughts and ideas. But what was it about these instruments that so ignited his passions as a small child, away from the standard piano and guitars that most children pick up. And what does his neighbours think when he gets the urge to practice during the wee small hours? Well let’s bring onto the show to start joining up dots, as we discuss the words of Steve Jobs in todays Free podcast, with the one and only Mr Andrew Douglas. How he believes that in life the most important thing is to be willing to detour from your original plan to find a way around the obstacles. How he spent five years as a child at boarding school and really feels that it was the making of him as an open minded, travel hungry piper. How he wont let anyone knock him off his path to greatness by making him feel guilty that he is spending so much time on his dream. Why he flossed for over six months just to prove to the hygienist that flossing was a waste of time, and was astonished what the lady said to him at the end. PrevPrevious223: Deborah Owen: A lady Who Lives By The Words “Whats Next”?